Whenever I release new patterns I feel like I’m sending my babies out into the world. Will people out there welcome them? Will they travel far? When the first sale of a new design comes in I inwardly breathe a sigh of relief and know that another of my “babies” has been accepted. So here go my two newest babies, out into the big wide world. 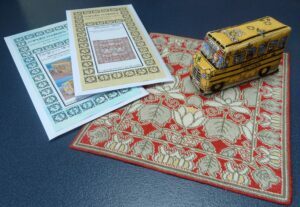 The sunny yellow BrightSea Village school bus and another miniature Arts & Crafts style carpet, Hasland Hill. This entry was posted in BrightSea Village, Miniature Carpets & Rugs on March 31, 2014 by Elli Jenks.